Introduction: Bipolar transurethral resection of prostate (B-TURP) was introduced as an alternative procedure to minimize the surgical complications of monopolar TURP (M-TURP). However, there are concerns about increased incidence of stricture urethra (SU) post B-TURP. This study was designed to analyze the incidence of SU among patients undergoing M-TURP versus B-TURP. Materials and Methods: This is a randomized controlled, single-blinded study; randomization was performed using a stratified permuted randomization algorithm (1:1 ratio) and only the patients were blinded. Both M-TURP and B-TURP were performed with a 26 Fr resectoscope; the electrosurgical generators were Karl Storz Autocon II 400 and Olympus UES-40 SurgMaster (TUR in saline [TURIS] method), respectively. Follow-up visits were scheduled at 3, 6, and 12 months post surgery and patients with lower urinary tract symptoms and a maximum urinary flow rate of <10 ml/sec on uroflowmetry underwent retrograde urethrography to assess for development of SU. Results: Forty patients were randomised to each arm. None developed SU in the monopolar group, whereas there were three cases in the bipolar group (P = 0.2). Among these three patients, two belonged to the failed medical management subgroup and one to the refractory urinary retention subgroup (P = 1.0). Conclusion: The incidence of SU following B-TURP using the TURIS system was comparable to the conventional M-TURP. Moreover, the incidence of SU was same for both the techniques when sub-grouped according to the indication for surgery that is failed medical management versus refractory urinary retention. This study is aimed to analyze the incidence of SU among patients undergoing monopolar versus bipolar TURP for BPH. Sample size was calculated for parallel group noninferiority trial with a binary outcome (presence or absence of SU) and a sampling ratio of 1:1. The null hypothesis of the study was that the percentage of patients with SU after M-TURP would be greater than that after B-TURP. Taking an 80% power of the study with a 5% level of significance and a 6% noninferiority limit based on the available literature, the minimum sample size of 40 per group was calculated. The Institutional Ethics Committee approval was taken for the conduct of the study and informed written consent was obtained from the participants. All patients of BPH undergoing surgical management over a period of 1 year at our tertiary care center were enrolled in this randomized controlled trial (RCT), including those with acute urinary retention who had failed catheter-free trial while on alpha-blockers. Patients who had undergone previous prostatic surgery, those who underwent relook cystoscopy to assess for failure to void or postoperative hematuria after TURP, patients with known urethral stricture, neurogenic bladder, bladder stone, and patients with any previous urethral instrumentation other than catheterization for acute urinary retention were excluded from the study. Patients were randomized to the study arms using a stratified permuted randomization algorithm in a 1:1 ratio and the allocation concealment was performed by the closed envelope method. An independent researcher prepared the envelopes, including writing the treatment name on a sheet of paper inside it. In the operation room, another independent nurse opened the envelope and informed the urologist of the procedure to be performed. Patients were blinded to the intervention type, but blinding of the treatment provider and outcome assessor could not done due to the nature of the study, thus it being a single-blinded study. The International Prostate Symptom Score (IPSS), clinical findings on digital rectal examination, maximum urinary flow rate (Qmax) on uroflowmetry, and prostate volume on transrectal ultrasonogram (TRUS) were recorded preoperatively. IPSS and Qmax were not recorded for patients with indwelling catheters, for obvious reasons. M-TURP under glycine irrigation was performed with Karl Storz Autocon II 400 electrosurgical generator (Germany) with the power settings of 120 Watt (W) and 80 W for cutting and coagulating currents, respectively. B-TURP was performed by the TUR in saline (TURIS) method with Olympus UES-40 SurgMaster electrosurgical generator (Japan), with a power setting of 280 W and 120 W for cutting and coagulating currents, respectively. A 26 Fr continuous flow resectoscope was used for both the techniques. All surgical procedures were performed by consultant urologists with an equivalent experience, under spinal anesthesia. Third generation cephalosporin was administered as the prophylactic antibiotic, with a preoperative dose followed by two postoperative doses in patients with failed medical management, whereas it was continued till postoperative catheter removal in patients who had been on indwelling catheter preoperatively. At the end of each procedure, a 22 Fr three-way Foley catheter was inserted, and continuous bladder irrigation was commenced with saline. The catheter was removed 24 h after urine had become clear, following the cessation of irrigation. Perioperative data such as operative time (defined as the time elapsed from the first loop pass to the introduction of the urethral catheter), weight of resected prostate chips, and durations of urethral catheterization and hospitalization were collected. The patients were followed up with recording of IPSS and Qmax at 3, 6, and 12 months after surgery. Retrograde urethrography was performed in patients with lower urinary tract symptoms and a Qmax <10 ml/sec, to assess for SU. Those patients who developed SU were not assessed for IPSS and Qmax during the subsequent follow-ups. Data were entered in the Statistical Package for the Social Sciences (SPSS) Version 16 (SPSS Inc. Released 2007. SPSS for Windows, Version 16.0 SPSS Inc., Chicago, USA) and checked for errors using univariate analysis. Mean and standard deviation was used for quantitative continuous variable. Independent t-test was used to compare improvement in IPSS score, improvement in Qmax, and durations of catheterization and hospitalization in treatment groups. The analysis of variance test was used to compare the levels of mean IPSS as well as mean Qmax, between the four treatment subgroups, namely, the failed medical management and refractory urinary retention subgroups among the monopolar and bipolar groups, at different stages of follow-up. Fisher exact test was used to compare the incidence of SU between the study groups. The two-tailed P < 0.05 was considered as statistically significant for the analysis of all variables. 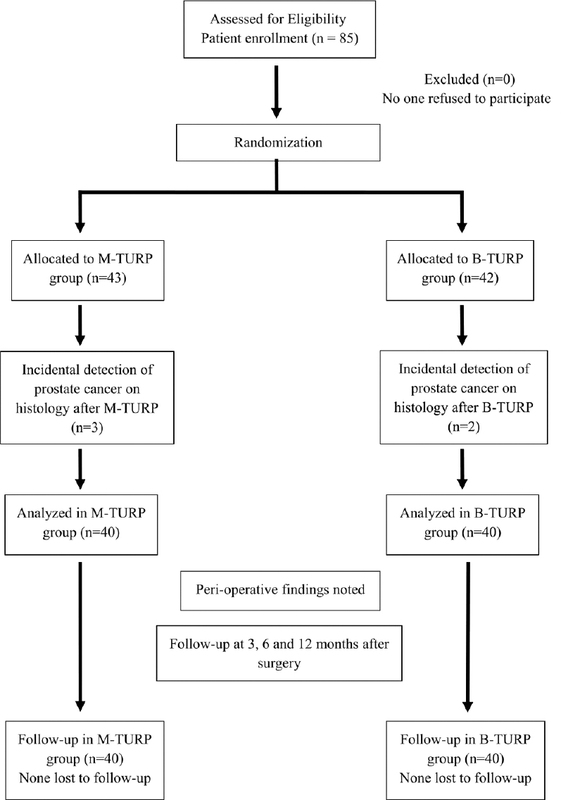 Between June 2014 and May 2015, 85 patients undergoing TURP were recruited in this study. After excluding patients incidentally found to have prostate cancer on the histopathology report after TURP, 40 patients were analyzed in each of the study groups and complete data was available for all the patients at the end of 12-month follow-up [Figure 1]. The age range of patients in the monopolar group was 52–82 years and that in the bipolar group was 46–82 years [Table 1]. Both the groups of patients had comparable comorbidities [Table 2]. There were three patients with bilateral hydronephrosis in the bipolar group and one in the monopolar group, all of them presented with refractory retention. The mean prostatic volume as measured by TRUS and the weight of the resected prostate were comparable in both the groups [Table 1]. The largest gland in the monopolar and bipolar groups measured 86 ml and 119 ml, respectively, on TRUS and the corresponding operative times were 65 min and 75 min. There was no significant difference in the mean operative time as well as the postoperative catheterization and hospitalization durations between the two groups [Table 1]. There was a significant reduction in the postoperative mean IPSS and a significant increase in the postoperative mean Qmax at 12 month visit as compared to the respective preoperative values, for all the patients in the failed medical management subgroup of both the monopolar (25 patients) and the bipolar groups (29 patients) (P < 0.0001). The mean IPSS and the mean Qmax at 6 and 12 months for the latter subgroup were calculated only for 27 patients because two patients had developed SU at the 3-month follow-up in this subgroup. The mean improvement in the IPSS score and the Qmax from baseline to 3 months, to 6 months and to 12 months were similar between the subgroups [Table 3] and [Table 4]. Both IPSS and Qmax could not be calculated at the baseline for patients with refractory retention in both the monopolar and bipolar groups, and hence, it was technically impossible to calculate the improvement in these parameters at the 3, 6, and 12 months followup. Although the 3-month mean IPSS score in the refractory retention subgroup of the monopolar group (8.9 + 1.3) was significantly lower than that of other 3 subgroups (P = 0.01), this difference resolved at further follow-up and the mean IPSS score was similar between the four subgroups at 6 (P = 0.1) and 12 (P = 0.2) months. There was no difference in the postoperative mean Qmax between the four subgroups, at all stages of follow-up [Table 3] and [Table 4]. Recatheterization was required in three cases in the monopolar group (7.5%) and in one case in the bipolar group (2.5%) since they had failed to void urine after postoperative catheter removal. All these patients of both the groups were treated with a combination of antibiotic and anti-inflammatory therapy, and were able to void after 1 week. No patient required blood transfusion or re-operation or developed TUR syndrome in either of the groups. No patient developed stricture urethra at 12 months of follow-up in the mono-polar group, whereas there were three cases of SU in the bipolar group (7.5%), all the cases being diagnosed within the 3-month post-operative period. Among these three patients, two belonged to the failed medical management subgroup and one belonged to the refractory urinary retention subgroup. However, this small difference between the mono-polar and bipolar groups (P = 0.2) and within the bipolar group between the failed medical management and refractory urinary retention subgroups (P = 1.0) did not reach statistical significance. 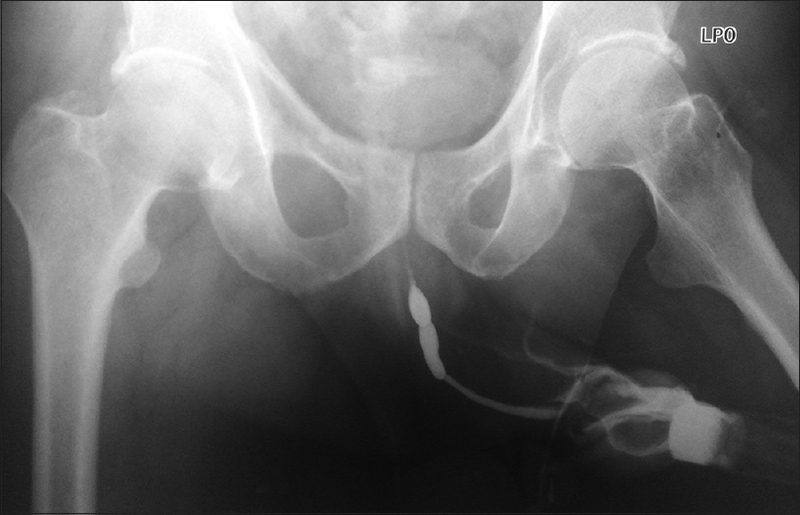 Two patients developed stricture in the bulbomembranous urethra and the other one developed it in the distal bulbar urethra; all of them were managed with urethral dilatation [Figure 2]. Within the bipolar group, peri-operative parameters were similar between the 3 patients who developed SU as compared to 37 who did not [Table 5]. None of these three patients who developed SU had required recatheterization in the postoperative period. In the current study, the post-operative catheterisation and hospitalisation times were similar between the two groups, which is in concordance with the previously available literature.,,, In the study by Tefekli et al., re-catheterization was required for failure to void after catheter removal in 2% of the patients undergoing bipolar TURP and in 2.1% of patients in the monopolar group. An additional 4.1% of patients in the bipolar group required recatheterization for postoperative irritative urinary symptoms. In our study, recatheterization was required in 2.5% patients of the bipolar group and 7.5% patients of the monopolar group, all for failure to void after catheter removal. Failure to void after TURP may be due to a combination of multiple factors such as edema of the residual prostatic tissue, postoperative urethral pain, and a poorly contractile bladder. In a number of previous RCTs and systematic reviews, concerns have been raised about postoperative urethral stricture after B-TURP, especially with the use of the TURIS system.,,, The “quasi-bipolar” TURIS system with its passive electrode located on the sheath of the resectoscope has consistently raised speculation about the electrical current leakage, which potentially can cause urethral stricture. In our study, there were three cases of SU in the bipolar group (7.5%), all in the bulbar urethra, whereas no SU were recorded in the monopolar group. However, this difference was not statistically significant. In the study by Komura et al., the incidence of post-operative SU appeared to be significantly higher in the TURIS group and was more commonly located in the membranous urethra. The authors believed that the mechanism of SU after TURIS was different from what is described for bladder neck contracture after M-TURP. They suggested that different mechanism of current flow in the TURIS system might cause some electrophysiological stress to the membranous urethra, a point where the returning current interacts with the urethral tissue and the passive electrode sheath. No patient developed bladder neck contracture in our study in either of the treatment arms. In the same study by Komura et al., it was observed that the higher urethral stricture rate in the TURIS group was significantly associated with longer operation time and larger preoperative prostate volume of >70 ml. However, in our study, no such association could be elicited. Furthermore, some studies also propose that a longer postoperative catheterization time increases the post-operative chances of SU formation. This association also could not be substantiated in our study as the average catheterization time among the three patients who developed stricture was shorter than that in the other 37 patients of the bipolar group. Moreover, among these three patients, two belonged to the failed medical management subgroup and one belonged to the refractory urinary retention subgroup, which shows that preoperative catheterization also did not have any significant effect on the development of SU. TUR by whatever modality invariably leads to mechanical and thermal stress. Besides longer operative time and longer catheter time, the other factors that cause mechanical stress are an oversized resectoscope and its inappropriate axial and rotating movements. Michielsen and Coomans used a 24 Fr resectoscope for both M-TURP and TURIS bipolar system, in their study. Komura et al. also used a similar sized resectoscope in both the groups, but it was 26 Fr. In our study also, the fact that a larger resectoscope size might be responsible for SU was nullified by using a 26 Fr resectoscope for both the treatment arms. The main factor leading to thermal stress is the intensity of the current utilised during the different steps of prostate resection. Michielsen and Coomans performed M-TURP using 175 W cutting and 75 W coagulation power settings and TURIS with 270 W cutting and 75 W coagulation power. 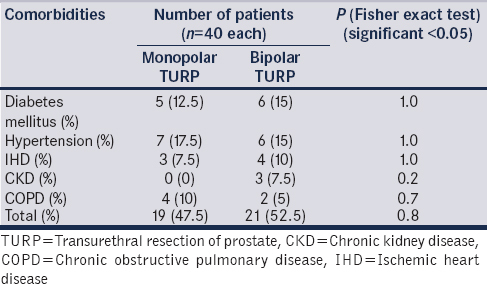 The incidence of SU in their study was 2.4% in M-TURP and 1.5% in bipolar TURIS group (P > 0.05). They concluded that although there are concerns about the possible traumatizing impact of the higher cutting current in B-TURP on the urethra, the incidence of SU seemed acceptable and the procedure was found as safe as the conventional M-TURP. In the randomized study of a total of 185 patients by Fagerström et al., M-TURP was performed with 130 W cutting and 50 W coagulation currents and B-TURP with the TURIS system at 280 W cutting and 100 W coagulation currents. Two patients in the bipolar and one in the monopolar group developed urethral strictures on follow-up. Once again, this difference was statistically insignificant. At the other end of the spectrum, in the study by Komura et al., where M-TURP was performed at 120 W cutting and 60 W coagulation currents and B-TURP at 300 W cutting and 120 W coagulation currents, the incidence of SU was significantly higher in the B-TURP group (19%) as compared to that in M-TURP group (6.6%). In our study, the cutting and coagulation current settings for M-TURP were 120 W and 80 W, respectively, and that for B-TURP were 280 W and 120 W, respectively. Although the incidence of SU was 7.5% in B-TURP and none in M-TURP group, this difference was not statistically significant. The incidence of SU following B-TURP using TURIS system was comparable to the conventional M-TURP. Both the techniques were equally effective clinically. It was further observed that there was no difference in the incidence of SU for both the techniques, based on the indication for surgery that is failed medical management versus refractory urinary retention. Zwergel U, Wullich B, Lindenmeir U, Rohde V, Zwergel T. Long-term results following transurethral resection of the prostate. Eur Urol 1998;33:476-80. Rassweiler J, Teber D, Kuntz R, Hofmann R. Complications of transurethral resection of the prostate (TURP) – Incidence, management, and prevention. Eur Urol 2006;50:969-79. Mamoulakis C, Trompetter M, de la Rosette J. Bipolar transurethral resection of the prostate: The ‘golden standard’ reclaims its leading position. Curr Opin Urol 2009;19:26-32. Mamoulakis C, Ubbink DT, de la Rosette JJ. Bipolar versus monopolar transurethral resection of the prostate: A systematic review and meta-analysis of randomized controlled trials. Eur Urol 2009;56:798-809. Tefekli A, Muslumanoglu AY, Baykal M, Binbay M, Tas A, Altunrende F, et al. A hybrid technique using bipolar energy in transurethral prostate surgery: A prospective, randomized comparison. J Urol 2005;174:1339-43. Komura K, Inamoto T, Takai T, Uchimoto T, Saito K, Tanda N, et al. Incidence of urethral stricture after bipolar transurethral resection of the prostate using TURis: Results from a randomised trial. BJU Int 2015;115:644-52. Tan GH, Shah SA, Ali NM, Goh EH, Singam P, Ho CCK, et al. Urethral strictures after bipolar transurethral resection of prostate may be linked to slow resection rate. Investig Clin Urol 2017;58:186-91. Wendt-Nordahl G, Häcker A, Reich O, Djavan B, Alken P, Michel MS, et al. The vista system: A new bipolar resection device for endourological procedures: Comparison with conventional resectoscope. Eur Urol 2004;46:586-90. Singh H, Desai MR, Shrivastav P, Vani K. Bipolar versus monopolar transurethral resection of prostate: Randomized controlled study. J Endourol 2005;19:333-8. Hon NH, Brathwaite D, Hussain Z, Ghiblawi S, Brace H, Hayne D, et al. Aprospective, randomized trial comparing conventional transurethral prostate resection with plasmaKinetic vaporization of the prostate: Physiological changes, early complications and long-term followup. J Urol 2006;176:205-9. Tang Y, Li J, Pu C, Bai Y, Yuan H, Wei Q, et al. Bipolar transurethral resection versus monopolar transurethral resection for benign prostatic hypertrophy: A systematic review and meta-analysis. J Endourol 2014;28:1107-14. Zamel AA, Kassem AI, Orban TZ, Saad IR, Bedair AS. Urethral stricture disease after bipolar prostatectomy: Is it a concern? Afr J Urol 2018;24:24-7. Issa MM. Technological advances in transurethral resection of the prostate: Bipolar versus monopolar TURP. J Endourol 2008;22:1587-95. Miki M, Loritani N. TUR in Saline: TURis. Tokyo, Japan: Publisher Olympus Corporation; 2004. Michielsen DP, Debacker T, De Boe V, Van Lersberghe C, Kaufman L, Braeckman JG, et al. Bipolar transurethral resection in saline – An alternative surgical treatment for bladder outlet obstruction? J Urol 2007;178:2035-9. Michielsen DP, Coomans D. Urethral strictures and bipolar transurethral resection in saline of the prostate: Fact or fiction? J Endourol 2010;24:1333-7. Rose A, Suttor S, Goebell PJ, Rossi R, Rübben H. Transurethral resection of bladder tumors and prostate enlargement in physiological saline solution (TURIS). A prospective study. Urologe A 2007;46:1148-50. Ho HS, Yip SK, Lim KB, Fook S, Foo KT, Cheng CW, et al. Aprospective randomized study comparing monopolar and bipolar transurethral resection of prostate using transurethral resection in saline (TURIS) system. Eur Urol 2007;52:517-22. Chen Q, Zhang L, Fan QL, Zhou J, Peng YB, Wang Z, et al. Bipolar transurethral resection in saline vs. traditional monopolar resection of the prostate: Results of a randomized trial with a 2-year follow-up. BJU Int 2010;106:1339-43. Djavan B, Madersbacher S, Klingler C, Marberger M. Urodynamic assessment of patients with acute urinary retention: Is treatment failure after prostatectomy predictable? J Urol 1997;158:1829-33. Mamoulakis C, Schulze M, Skolarikos A, Alivizatos G, Scarpa RM, Rassweiler JJ, et al. Midterm results from an international multicentre randomised controlled trial comparing bipolar with monopolar transurethral resection of the prostate. Eur Urol 2013;63:667-76. Faul P, Fastenmeier K. The role of lubrication in transurethral electrical resection. Urologe A 2008;47:326-30. Fagerström T, Nyman CR, Hahn RG. Complications and clinical outcome 18 months after bipolar and monopolar transurethral resection of the prostate. J Endourol 2011;25:1043-9.